What would happen if you took the sinister futuristic technological applications of Black Mirror, made them from military hubris, and combined them with memories built on the existentially horrifying repetition of Groundhog Day? 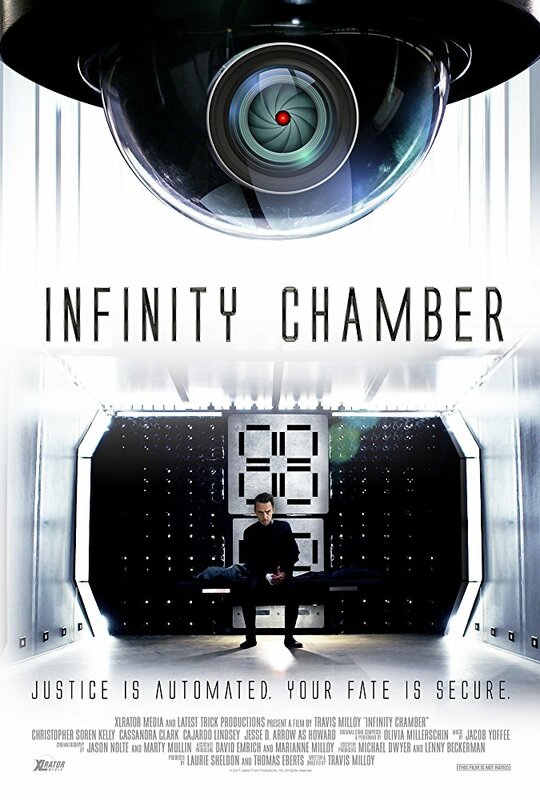 You’d essentially have the experience of Frank Lerner (Christopher Soren Kelly), the human protagonist of Infinity Chamber, who awakens to such a hellish nightmare without any answers to the reason for his incarceration – save the vague, enigmatic responses he receives from his “Life Support Operator”, a computerized voice inside a camera which asks Frank to call it “Howard”. The real story of Infinity Chamber is that of piecemeal human memory, its fallibility and tendency to fill in details when it is incomplete. Completely isolated save for his dialogue with “Howard” (voiced by Jesse D. Arrow), Kelly’s Frank Lerner tries to understand the circumstances under which he has become a prisoner – but there is not much actual world-building outside of the walls of his cell that doesn’t exist solely within his mind; we don’t get a real sense of the danger the world has been in, what governmental anarchy and military violence has preceded the creation of the unusual prison, or the deeds which may have landed Frank within its smooth, sterile chambers. Travis Milloy’s film finds most of its greatest strengths in the exact same places it finds its greatest weaknesses. 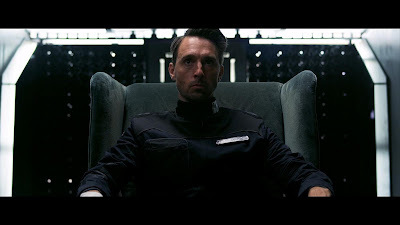 As the movie itself points out, memory is an unreliable narrator – and Frank’s point-of-view is the only one we really see throughout the film, so it’s difficult to piece things together any faster than he does. We don’t know enough about Frank’s life before waking in his futuristic cell to take sides, either – how reliable is Frank to tell his own story? Is he innocent, as he claims to be while appealing to “Howard”, or is there a good reason he’s been zapped by government officials and sent to live in perpetual solitude, with only his camera-companion to make small talk? “Howard” isn’t helpful, either; as a digital representation of a caretaker in the most basic sense, he doesn’t give the audience any knowledge that he isn’t sharing directly with Frank. At first, it looks like this film is completely metaphorical, using the symbolism of “life support” to illustrate how the body and mind themselves are merely prisons; “Howard” tells Frank his job is to keep him alive, which becomes more and more difficult as supplies begin to run dry and there is less water and food to provide his charge. Frank’s memories, particularly those in recurring scenes with a coffee-shop owner, Gabby (Cassandra Clark) and her wall of photography, feel like attempts to grapple with a life in Frank’s distant past, a life he’s trying hard to break through psychological walls to regain as a set of whole memories to comfort him as his life begins to leave him. Frank talks about his father’s circulatory life support device, and we’re set up for a metaphorical comparison. Interestingly, this might have made more sense in the long run than what actually happens; as Frank continually tries to escape to no avail, there is a creeping sense that this is something like Pixar’s Inside Out, only written by Jean-Paul Sartre and directed by Stanley Kubrick. But there are literal ties to the world outside, and the ending tries to link Frank’s muddled memories to a narrative we only catch in fractured glimpses. There are some intriguing ideas at play, and the implications of what has occurred in the world at large since Frank’s incarceration would have made for even more interesting storytelling, were we able to see more of it. It’s unfortunate that we don’t really get a detailed sense of Frank’s universe; the film makes motions at using the prison cell itself as an illustration of what occurred on the outside, but taken all together, it’s still a little confusing. Kelly and Clark are more than capable actors, both comfortable in the strange, contained roles they play in puzzle-piece scenes from Frank’s memory; their chemistry is warm and sweet, making their scenes together the brightest in the film. But Kelly carries a lot of the story on his own – his dialog with the exasperating, amusing “Howard”, fraught as it is with his anxiety and rage, is in itself almost sweet. In his tiny reality, he must use his mechanical companion as a means to maintaining his sanity, and rebuilding his consciousness brick by brick. It’s a strange relationship for sure, but one also oddly endearing. 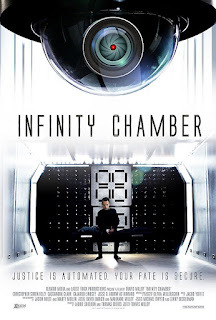 Infinity Chamber is an interesting experiment in storytelling, but while its basic premises pique intrigue, there are a number of details it leaves to guesswork. If one chooses to adopt a more metaphorical approach to Frank and his prison cell scenes, one might make some parallels between the psyche within and the political machine without. But it’s a stretch, as interesting as the idea may be, and one finds oneself wanting a little bit more from the movie itself. Its immersive psychological environment lends itself well enough to some imaginative theories; it’s a bit of a shame that the film itself chooses one of the most obvious ones with which to answer its questions.